The architectural design blog takes on the McMansions of Texas. 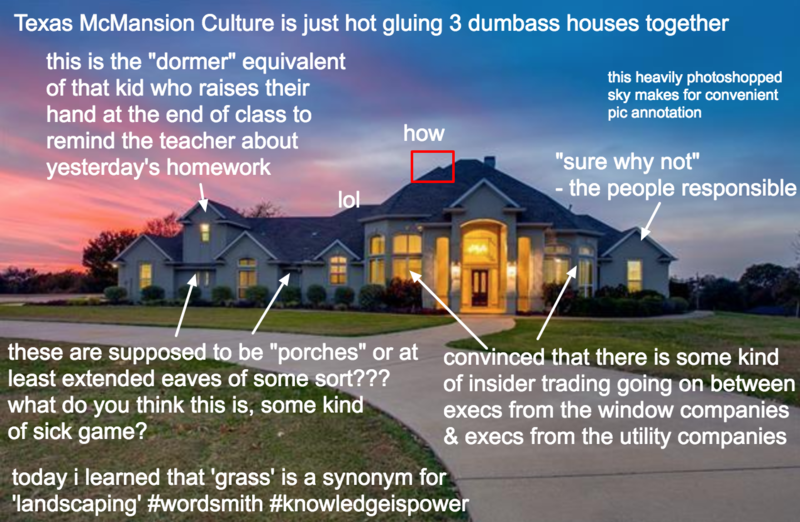 The architectural design blog McMansion Hell has made its name with meme-ready roasts of ugly suburban houses, often coupled with insightful commentary on city planning and residential development. (Its author, Kate Wagner, is a writer and critic who got her master’s degree studying architectural acoustics.) But it’s the roasts that have made McMansion Hell a hit among a certain segment of the internet: funny captions critiquing the mass-produced, ostentatious homes that, in the world of McMansion Hell, stand for the American dream of homeownership gone horribly wrong. The blog has over the last several years found plenty to work with in the suburbs of Dallas. But McMansion Hell’s newest series, a bracketed faceoff featuring all 50 states, has given the blog an excuse to look more closely at Texas this summer. Voting is ongoing to determine the worst McMansion in Texas, with several contenders from the Dallas area, including representatives from Rockwall and Denton counties. Scan through Part One and Part Two for a taste of the McMansion Hell all around us.